This recently renovated apartment is situated in the sophisticated Sarrià-Sant Gervasi neighbourhood of Barcelona. Located just outside the city centre, this area is a little more tranquil but boasts many great bars, cafés and restaurants nearby. Just a stone’s throw from the trendy neighbourhood of Gràcia, less than ten minutes’ walk away, you will have everything on your doorstep to enjoy Barcelona like a true local and will have the best of Barcelona’s sights within easy access from the metro. This fantastic apartment features one bedroom with a double bed, sleeping up to 2 people, a desk, beside tables and lots of built-in storage. Since the apartment has recently been renovated, there is a modern yet homely feel throughout, with contemporary furnishings and lighting. The living and dining area comes complete with a comfortable sofa, coffee table, flat screen television and a dining table complete with 4 chairs. Additionally, the apartment boasts its very own decked private terrace with outdoor furniture, providing the perfect space to relax in the Mediterranean sunshine and enjoy drinks with friends or family, or simply get some downtime. The glass doors that open out to the terrace mean the apartment welcomes plenty of natural light. The bright bathroom is modern and has a walk-in shower. The kitchen features brands new units, a large fridge freezer, a new electric hob, as well as an oven and dishwasher for your convenience. The apartment comes with many amenities, such as Internet connection, a washing machine and an elevator. Complete with both central heating and air conditioning, this apartment is the perfect choice for longer stays in the Catalan capital. Sarrià-Sant Gervasi is best described as a tranquil, upscale area, with plenty of parks and green spaces. Historically, the district was divided into three independent towns, which were finally annexed to Barcelona at the end of the 19th century and the beginning of the 20th century. While today the neighbourhood has quite a large population, it still maintains a local feel characterised by its narrow, quiet streets. Throughout the area, you will find a plethora of boutiques, trendy cafés, bakeries and fashionable restaurants. The nightlife in Sarrià-Sant Gervasi is known to be lively, with many of Barcelona´s most chic bars, clubs, and discotheques situated in this district. 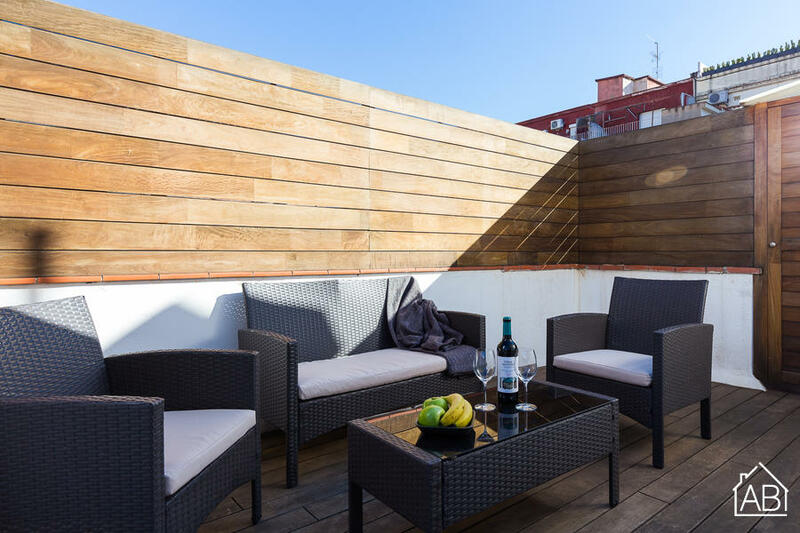 Choosing an apartment in Sarrià-Sant Gervasi gives you the perfect opportunity to escape the hustle and bustle of the city centre, while allowing you access to all of the main sightseeing hotspots in the Catalan capital by metro, bus and tram.